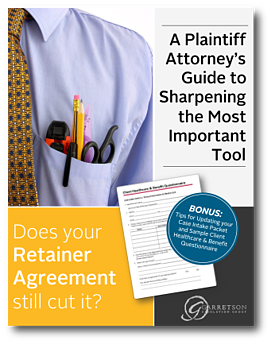 A Plaintiff Attorney’s Guide to Sharpening the Most Important Tool: Does your Retainer Agreement Still Cut It? Does your Retainer Agreement Still Cut It? It’s the document that opens every new case, and the one that gets you paid at closing. However, your retainer agreement should also give you the tools to safely navigate the increasingly complex settlement process. Recent ethics opinions should prompt you to revisit your retainer agreement. Once considered the “end of the road,” settlement of an injury claim can now feel like the beginning of a long and difficult process of healthcare lien resolution, government benefit preservation, and financial planning. If ignored until the end or handled poorly, these issues can delay disbursement, jeopardize the settlement and your client’s benefits (such as Medicaid or Supplemental Security Income), and lead to client dissatisfaction. It is critical that you are prepared for these challenges from the beginning of the case. To make the settlement process go as smoothly and quickly as possible, you will need certain information from the client upon opening your file. Moreover, if you determine that you need assistance with any settlement challenges, you will need the freedom to bring in outside expertise as advised by a growing number of ethics advisors and committees. It is critical that your clients are informed of all the obligations associated with pursuing and settling a personal injury settlement. The best time to do this is at the onset of the relationship, and the best instrument to disclose these issues, present them for discussion, and memorialize the client’s understanding is your retainer agreement. In this eBook, we detail tips for revising your retainer agreement to help you stay ahead of challenges, educate your clients, and protect yourself. We’ve also included a sample client healthcare and benefit questionnaire that you can use to gather information from your clients during the case intake process to ensure you have the necessary information to address issues such as healthcare liens and government benefit concerns.